Holly dates back much further than is commonly thought. The varieties we have today are descendants from the mid Pliocene era, some 3,000 million years ago. They originated in Europe and Northern Africa. When those areas started to dry out, the laurel forests retreated and the hardier hollies were one of the plants to take their place. American Holly (ilex opaca): looking very much like English varieties, these tend to grow slightly larger and have duller and wider leaves. They are native to the United States and their stems are used in Christmas celebrations. English Holly (ilex aquifolium): these are the types commonly grown in English parks and gardens. 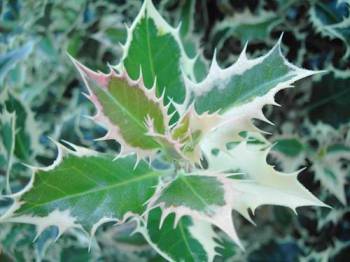 Some are plain green, some have variegated foliage, all have glossy, prickly leaves. The most popular foliage and berries in the UK for Christmas decorations. Japanese Holly (ilex crenata): often grown in the UK as a more disease resistant alternative to box. They have small leaves and can easily be trimmed to shape. Deciduous Holly: a separate group because they loose their leaves in winter but retain lots of red berries, favoured by birds as a food source. it tolerates damp soil better than other types. Others! : Several hybrids (crosses between the above groups) have been developed over the years. 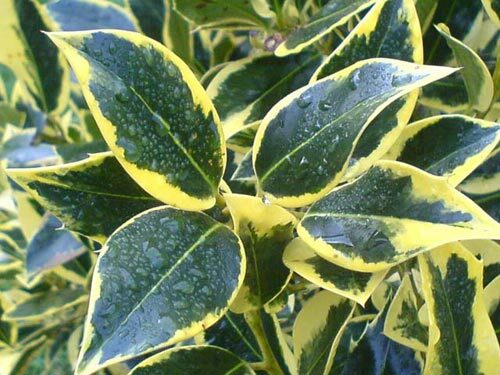 One which we can particularly recommend is Ilex altaclerensis Ripley Gold. We have written a separate page on this variety which can be found here. They are evergreen with leaf colour that ranges from plain green to bright yellow / green. If male and female plants are present most female plants will produce berries in winter. They grow on most soil types without problems except for water-logged ground. Their ideal would be a light loamy soil with good drainage. They prefer a slightly acidic soil but will grow on most soils that are not very alkaline. They grow best in full sun but tolerate partial shade well. Established plants require no attention other then an annual prune to shape. Most holly types can initially be grown in pots and containers for five years although after that they may require frequent pruning to keep them healthy and to size. Dwarf Japanese / Chinese hollies are more suited to permanently growing in containers. Holly trees can live for several hundred years in unrestricted and ideal conditions but under normal circumstances they live for about 75 years. This small tree can be planted in almost all light levels from partial shade to full sun. It grows quickest and produces more berries in full sun. When established a holly tree will look after itself. It rarely needs watering except in severe drought and will grow quite happily on average ground without the need of additional feeds. Pruning is not required for the first three years. After that pruning (see this section below) once each year will keep it to size and shape. The frequency of pruning depends on the shape and size you want the plant to grow to. Without pruning, a holly tree will grow quite happily and form a wide tree to a height of about 12m high for some varieties. Hollies respond very well to pruning and can be formed into a hedge shape or even a loose topiary figure. For those of you who prefer a smaller shrub then holly pruning can be done any time, although the best time is mid to late April. We wouldn't advise pruning after late July because the young shoots which appear after pruning may well be soft and easily damaged by early frosts. Pruning is simply a matter of cutting the holly back to shape and size. Prune the stems and avoid cutting the leaves. If you cut the leaves they will discolour at the edges although they grow through this after a couple of years. It's best to cut the stem above an actively growing bud. This will encourage the bud to grow and produce a new stem and leaves. A commonly asked question is how far back can I prune an overgrown Holly? They can be cut cut back quite severely and in our experience they almost always come back but it can take several years. If you trim back a medium to largish holly by 50% all over you will probably be left with a very bare plant with only a few actively growing stems. This is because previous overcrowding has prevented light getting to the centre of the tree. Although it will look very sorry for itself after hard pruning, wait a year and the bare wood, now exposed to light, will begin to sprout new growth. After two to three years your holly tree will begin to regain its shape. The hard pruning will have removed any potential for flowering (and berry production) for a couple of years but that will also return after two to three years. One word of warning about pruning large holly trees which has been gained from hard experience. Even though some of the leaves are far less prickly compared to others, they can still hurt you if they fall on you. Be careful, especially as far as your eyes are concerned. I always wear safety goggles when pruning holly trees. A holly tree is either female or male and most varieties will only produce berries on female plants. Plants which are like this are called dioecious plants. The male and female plants need to be near enough for bees and other insects to pollinate the female plants. The tiny white flowers appear in late May in most areas of the UK. The berries, green at first, begin to form in July time. In October they will begin to turn orange and then a few weeks later to their full red colour. Some varieties produce orange or yellow berries when ripe. One male plant will be sufficient to pollinate up to 20 females. If you only have room to grow one reasonable sized holly bush in your garden then make sure it is a female holly plant. Not only do they form better plants on the own, compared to the males, but there is a chance that there is a nearby male plant. One space saving solution is to grow a small male holly plant in a container (see container growing below) purely for the purpose of pollinating your prized female plant. The key to producing larger amounts of holly berries is to prune annually around mid to late April time. Annual pruning will not only keep your tree to the shape and size you want but will also minimise the need for hard pruning which will remove the majority of flower buds. You can of course not prune at all and the berries will form just fine. But in the end you will have a massive tree unsuitable for most gardens. 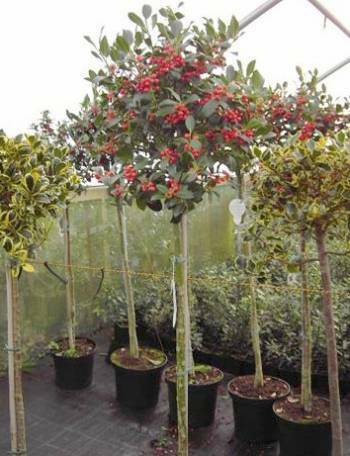 Hollies are slow growing trees and are suited to growing in containers. You will find that for the first five years an annual prune will keep them to shape but after that they will probably require pruning twice a year. The plant should be fed monthly between mid March to mid August with a handful of blood, fish and bone. It will of course require regular watering. Wait each time until the top 3cm of the compost is dry and then water well. Some varieties of of holly are more suited to growing in containers because they are dwarf by nature. 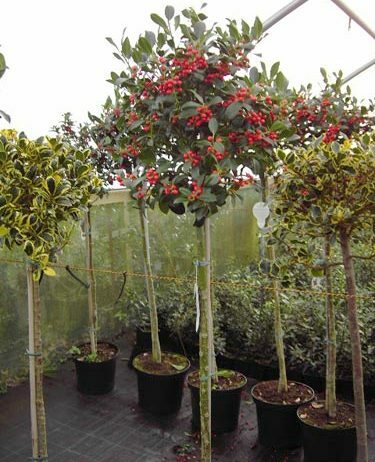 Chinese hollies (ilex cornuta) are probably the best varieties for growing in containers. Birds will eat the berries but they tend to wait until late in season when food is becoming very scarce. Expect the berries to remain largely untouched until early February. In may cases no damage is done at all. Occasionally aphids fees on some parts of hollies. This not a problem but the sticky and sweet goo which they secrete can attract a variety of moulds to form mainly on the leaves. In most cases it can be washed off by hand with water and a drop or two washing up liquid. If this doesn't do the job use a fungal spray which can be bought at garden centres and online. This not normally a pest it is almost certainly environmental. The first reason is poorly drained ground. The problem may not become apparent for a few years until there is a prolonged period of rain. In period of unusually changing weather, form very warm to very cold or from very wet to very dry the plant may be stressed and drop more leaves than normal. They will grow back when the weather becomes more "normal". Most garden centres sell a small choice of holly plants year round however they do tend to be expensive and the choice is often limited. The other drawback is of course that you don't know where they have been grown. Your best bet is to buy online from a specialist nursery, preferably one which specialises in holly plants. One stands out head and shoulders above the others and that is Welsh Holly. They are a dedicated holly nursery where they grow a huge number of these plants. They are the best source for healthy and reasonably priced holly trees in the UK. We thoroughly recommend them. The plants are healthy, they come well packaged and can be ordered from their website. Plants raised at this nursery will grow on well in almost all areas of the UK because they have been grown in average UK weather rather than in some of the milder areas. If you are in the Exeter area then we can also recommend the two St Bridget Nurseries nearby. They grow many of their own plants which can also be ordered online. They sell a reasonably good range of home-grown holly plants. 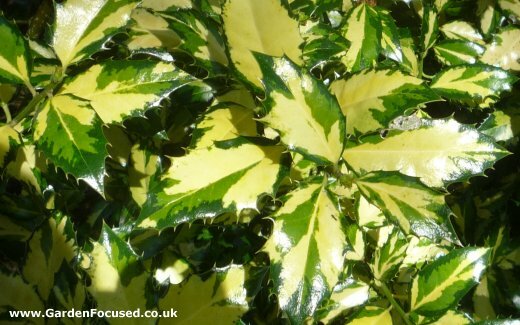 Hollies come in all shapes and sizes including variegated leaves. It's impossible for us to say which is holly is best for you because your needs and taste will be different from ours. We do have a few favourites though and these appear below. All pictures below are courtesy of Welsh Holly. They have a far more extensive library of pictures and descriptions which can be found here. Many people don't have room for more than one holly tree and this variety is the ideal solution because it is self-fertile and produces berries as a single tree. As you can see from the picture above J C van Tol makes an impressive standard holly. The evergreen leaves have almost no prickles and are dark green. the red berries are produced freely. It prunes to shape well and makes an ideal hedge or single show plant. It is available also with silver or gold variegated leaves. As much as we like the variegated leaves of many hollies, we prefer the plain green leaves of the normal variety. This variety is in male form only so won't produce berries but it can be used to pollinate other female varieties of holly. It makes an ideal centre point as a single plant or as a hedge. Birds will use it for shelter. An elegant and beautiful holly plant with spineless leaves. Berries are produced on female forms but not as much as other varieties. It is the long leaves which distinguish this variety. Left unpruned it can grow to 10m high though it is easily controlled with an annual prune. This variety grows quicker than most other hollies. 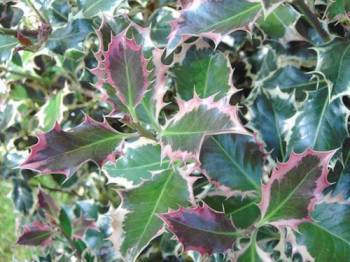 A variegated female form of holly with beautifully coloured leaves and deep red berries. One of the most popular of all the hollies, this variety dates back to 1770. The leaves have a pinkish hue when young which turns to silver and green. A definite winner. Hollies make excellent hedges and there is one particular variety which is particularly useful. It is Ilex crenata 'Dark Green'. Its growth habit and appearance is almost identical to a Box Tree hedge but with some distinct advantages. 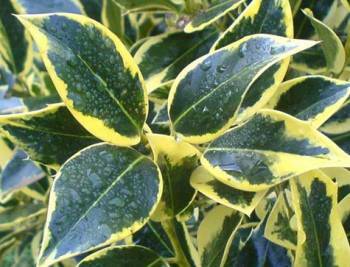 Another alternative, with slightly larger leaves, is Ilex crenata 'Golden Gem' - see the picture below. Firstly it is far more resistant to pests and diseases compared to Box tree hedges which in recent years have begun to suffer badly from a number of problems, see our Box Tree Caterpillar news article for example. 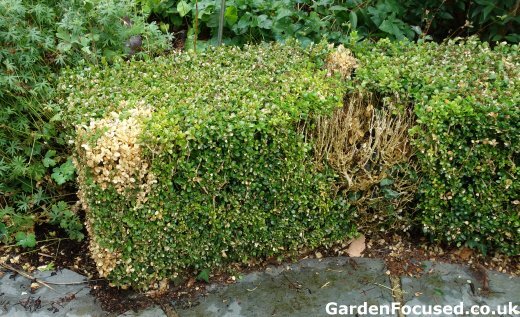 Box blight has also spread to many parts of the UK, Ilex crenata is not affected by Box Blight. 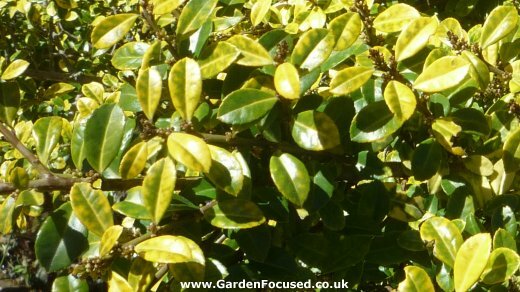 Ilex crenata also does not suffer from leaf burn when trimmed to shape, a distinct advantage and time saver when trimming hedges. It is also fully capable of springing back into growth from bare wood, something which Box is not capable of. We have negotiated a 10% discount on Ilex crenata 'Dark Green' for you from Victoriana Nursery. If you click on the link here, the 10% will be deducted at the checkout automatically, no need for a code. Below we list the key strengths and weaknesses of Hollies. QUESTION: Can I move a holly from one tub to a bigger tub without causing any problems to the holly bush? ANSWER: Yes you can. If the holly tree is outgrowing the existing container then it will do it good. QUESTION: I planted 18" American Holly bushes in the fall of 2017 in Michigan. I am interested to know if I can trim them now in April ? My goal is to get maximum growth for a privacy hedge. One person said I should not trim them this year. I should let the root system grow. Another person said I should trim them now in Mid April to spur growth. What is correct? ANSWER: It's best not to prune a holly tree in the first three to four years of its life. Let it establish itself and the leaves help to do this. When you do prune it, and this will tend to thicken it up, the advice to do it in mid-April is correct. QUESTION: In my street there is a holly plant growing on a different tree where the trunk separates in to the boughs. I noticed it a few years ago and it is still aive and well. It is one small branch. Have you heard of that before? I can't find any information where this is mentioned. ANSWER: I haven't seen that before but I have seen budleia growing in some very inhospitable places so I suppose it's the same. The V shape of two boughs have maybe accumulated some dust and particles over time allowing a holly seed to germinate there. QUESTION: Can ilex aquifolium pyramidalis aureomarginata be grown in pots? ANSWER: This is a strong growing holly and not one I would recommend for growing in a container.